or cash machine, cash point, etc., how much cash do you usually withdraw, and in what denominations? I usually get $100, always in $20 bills. It seems that ATMs in the US don't dispense any other denomination, at least not that I've seen at any time during the past ~25 years. I do remember that when I was in college, the ATM would dispense a minimum of $5, but that was a LONG time ago. When I lived in Europe (NL and Belgium), it was usually two €50 notes. I always found it strange that $50 bills are so rare in the US while €50 notes are so ubiquitous in Europe, even though they're worth more. lol ATM in Italy is Agenzia Trasporti Milano (the society which runs public transports in Milan). Back in topic, I usually get 50 € in banknotes of 5 or 10€, rarely 20€ and even more seldom an entire one by 50€. Obviously, I retire much more when I have higher expenses to do. I rarely withdraw cash. Maybe 2-3 times per year here in Norway. Debit and credit cards are accepted almost anywhere. It is a different story when I am abroad, though. 200 NOK (33 USD / 24 EUR / 20 GBP) is usually the smallest denomination available here. In the USA, $500 is usually the withdrawal limit, a few are higher, and some in bank lobbies are lower, to discourage non-accountholders from using them. I never take less than $500, because the fee is the same no matter how much I take. It is always 20s, but a few machines in ghettos also give tens. Then I have to go to the teller anyway, to change the wad of 20s into 100s, and they often don't even have any 100s at the teller windows. In America, a $100 bill is a rare and suspicious piece of paper, that many stores (such as gas stations) refuse to accept, even a few years ago when it cost nearly $100 to fill up a SUV, you still had to pay in 20s. A $50 bill is even rarer, most people have never seen one. I take out 200,000pesos which is 400 USD. It comes in denominations of 10,000 pesos. Very rarely do I have to do this. Only if I accidentally forget my cash at home. Here, the bills do not go above 20,000 pesos. ATMs are ubiquitous, there is no withdrawal fee and I don't really need much money for a day. So I usually get ~20€ in 10€ notes per withdrawal. I sometimes get 20€ notes, 50€ notes are also pretty standard. The withdrawal limit seems to be 9,999 NOK (1,666 USD) per day here i Norway. Maximum (includes card usage): 100,000 NOK (16,666 USD) over a 4-day period. 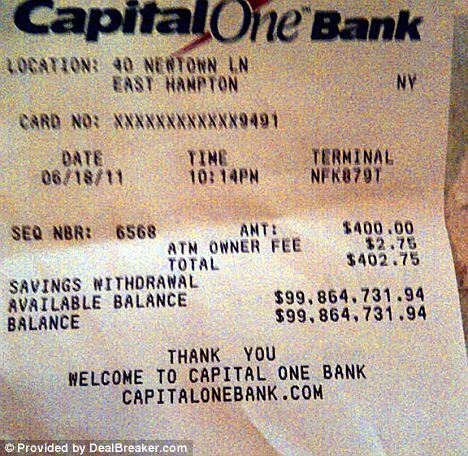 OT: This must be the perfect ATM receipt. Balance: $99,864,731.94 . It belonged to a hedge fund manager. In Canada ( Bank Machine was the original term, but ATM is taking over ) if I take out $100 it gives me 5 20's. If I take out $200, I get 2 50's and 5 20's, although sometimes it's 2 50's, 4 20's and 2 10's. This may depend on which banking institution I'm using. I have been using bank machines since they first came out. I don't remember a minimum, although there had to be one, but I do remember the receipt wasn't the flimsy paper it is now, but a print out, typed, on fairly substantial paper. 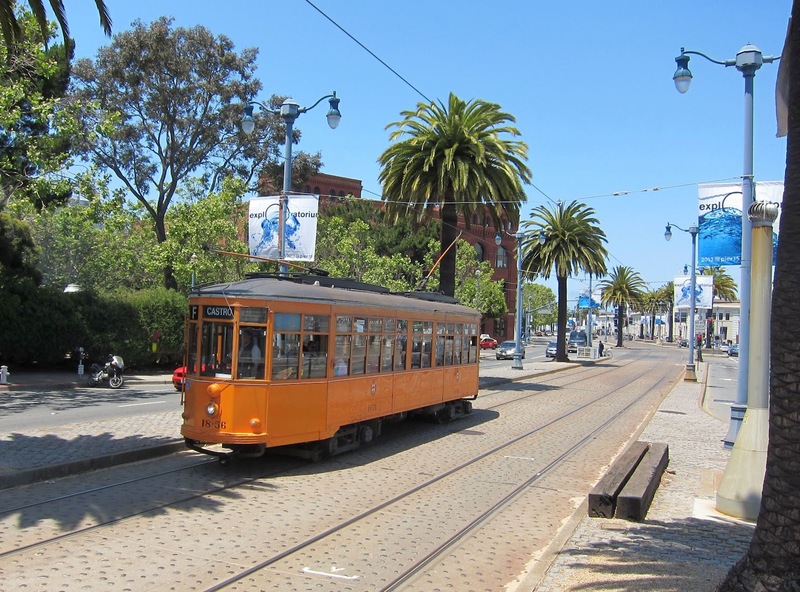 We have one of your old trams here in San Francisco. It has "USCITA" signs and everything. Some ATM machines in bodegas and chinese corner take-outs dispense $10s. The ATMs at Casinos dispense only $100s haha. I'm not so sure that's true, especially the bolded.